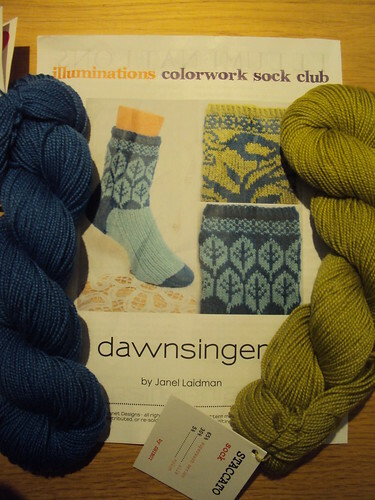 Last month I got the first instalment of the Illuminations Sock Club from Janel Laidman. I knew it was coming and was beside myself with excitement as I opened the parcel. I was in for a surprise… an anti-climax. This is a hard thing to say, but my first reaction was disappointment. I think, mainly, this was due to my over-heightened expectation. I’ve blogged before about how much I idolised this designers work. I was expecting complexity, ingenuity and “delight” in the Vetruvian / Architects meaning of the word. I was also expecting two sock patterns. What I got was a basic-looking, cuff-down, sock pattern with two charts for alternative designs around the leg. I felt this was not a good opener for a year-long sock club of six instalments. I immediately regretted signing up for the colourwork sock club. My kids can colour in squares on a grid to make a picture of a bird or a leaf – where’s the ingenuity in that. More than this, the colours didn’t “Wow!” me. I had planned a whole blog-post about their arrival at the end of February and… well… you can see the photo I took for it. Dull, drab, lifeless. For me, this says it all about my lack of enthusiasm. The blog-post never happened and I put the kit away wondering if I would just gift it to someone. Suddenly, I love them! They are the perfect encapsulation of Spring. *Now*, they sing to me. I realise that my timing had been all wrong. I needed to see them in the context of blue skies and fresh leaves; and not the dull skies and lifeless trees of last month. This new look at the skeins made me look closer at the sock pattern(s). I realise they’re not so basic after all – there’s something interesting going on with the ribbing of the foot. I’m willing to give the Sock Club an open-mind again. I’m willing to hope that the next installment will knock my socks off! I have very little to report for this month. In fact, checking back on my post for my January Round-up, the situation has hardly changed at all! GlenvArgh! is languishing while I focus on pattern-writing and knitting my design. While I don’t have an FO to show for it, pattern-writing has been a fascinating & thoroughly rewarding process. Having read a few timely tweets from other designers, I was prompted to work out the Maths first. I did this as far as I could visualise but then *had* to pick up the needles to test it out. It was just as well I did because I had made some classic, newbie mistakes. It took at least 3 attempts at the sleeve & shoulder shaping before I got it “right”. I also suffered two needle fatalities: one Denise cable and on of my Knit-pro cables. Frogged = 1… several times! Meanwhile, I did get a pair of socks into circulation, by darning a hole on one toe. These are my favourite socks, ever! They’re Embossed Leaves from Favorite Socks by InterWeave Press. There was stash enhancement but it was of the controlled, long-awaited variety; and therefore completely acceptable. 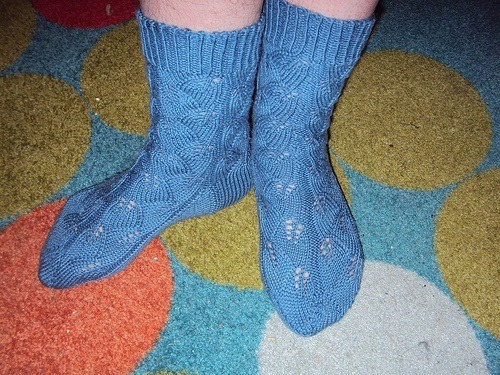 It was the first instalment of Janel Laidman’s “Illuminations” sock-club: two skeins of Staccato Sock by ShibuiKnits. I also didn’t complete my February skein for the SkAM-SpAL. I was reviving a spindle of Louet Northern Top that I had started last Summer. 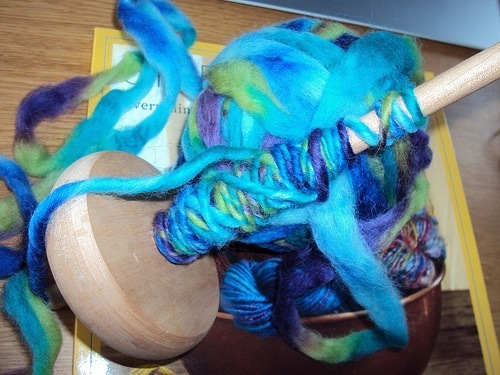 Though I enjoyed the spindling – and became quite good at it after practicing so frequently – it really is much slower. Meet ups = one, #twillting aka the Quilting workshop given by @MaryLD at the beginning of February. 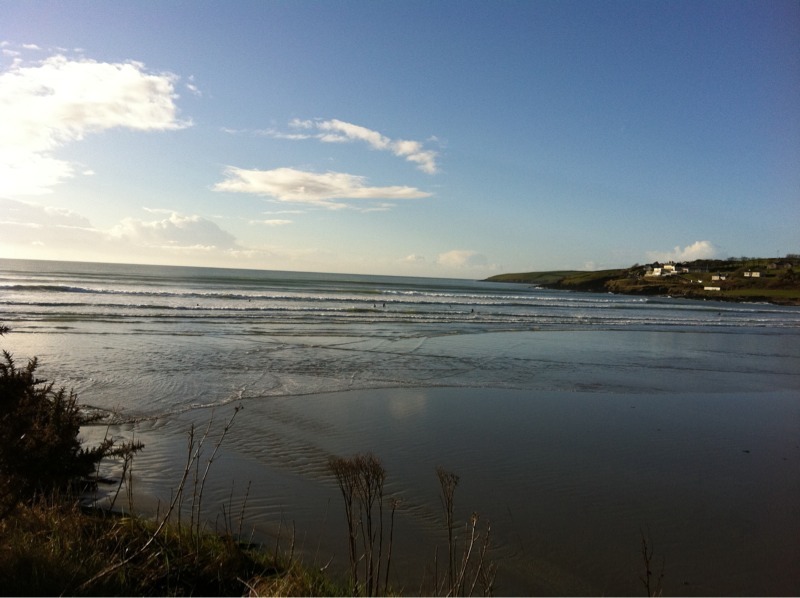 I had to bow-out of the February Spin-in because I was enjoying a weekend away in Inchydoney Hotel and Spa. It was a treat for my fortieth birthday. 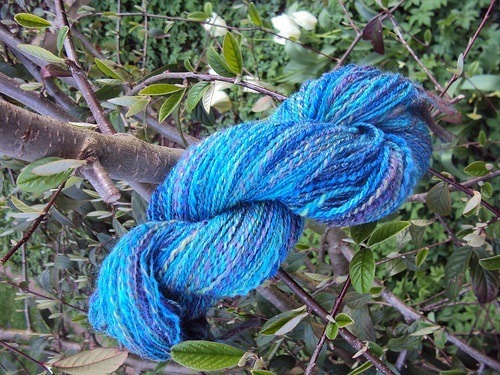 A new month, a new theme for our Skein-a-month Spin-a-long: Hope Springs Eternal. I like this theme – it could relate to the start of spring on 1st February (Irish / Celtic Calendar) and the Hope that Spring brings. Or… it could be a spring of water, bursting forth with promises of eternal hope. Or – as in my case – it could be the eternal optimism that springs from an ability to Hope! 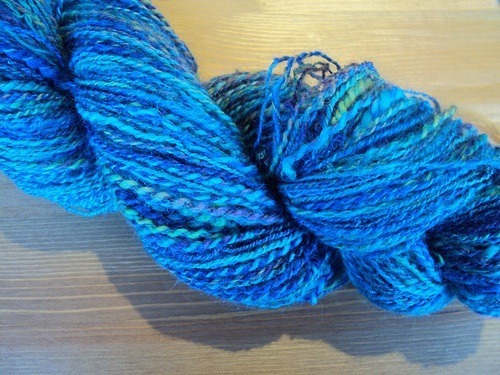 Hope that one day… I may be able to produce a skein of consistent yarn. 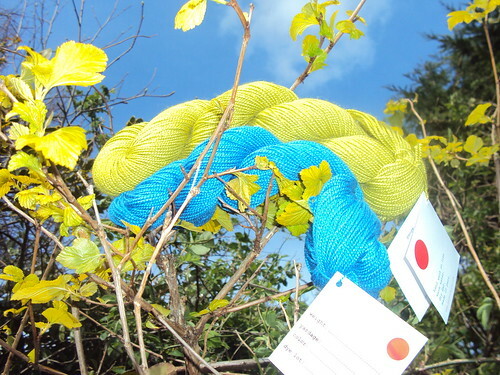 I bought these two “balls” of Louet Corriedale Top in TIK last summer; and started the first on my spindle. 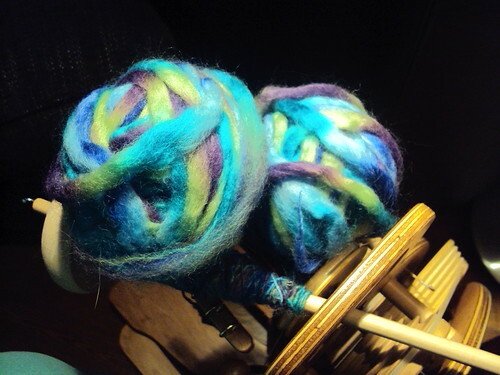 I had *hopes* that because it was pencil roving that I wouldn’t have to do as much drafting; thereby letting me focus on the other aspects of spinning I was struggling with… like the spinning bit… and the “adding twist”… and the “making yarn”! This was the project I brought with me to the January Spin-in last Sunday. I started off the wheel-spun single and did a fine impersonation of someone who hadn’t a clue what they were doing with a wheel in front of them. Yes, this was the morning after the night before and my over-indulgence played havoc with my abiltity to draft and treadle at the same time. I switched to the spindle and was quite pleased with myself for trying to draft without parking. I had been watching BionicLaura and DubSpinner as they were doing this and had a little epiphany. 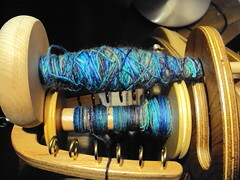 Then my spindle decided to fall out with me too (possibly something to do with me over-spinning the yarn – what-evahz!) so I gave up and switched to knitting! The Spin-in was periodically visited by the enthusiastic students of Aoibhe’s wheel-spinning workshop: SusyMcQ, KneeHigh and two others that I didn’t get the name of. 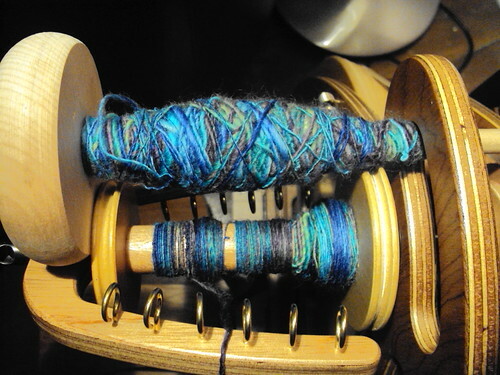 Susan now reports that she can spin from the fold and Navajo ply. I haz the mad jealous! But also… HOPE! If someone can spin from the fold and Nav-ply after an afternoon spinning workshop why can’t I? Step one is that I tell myself “there’s no reason why not!”; Step two is that I grasp the hope that this realisation brings and just get on with it. So thank you, Aoibhe and Susan – even though I wasn’t taught how by the former or shown by the later – just the fact that I know this is possible instils *HOPE* that I can!